We've been enjoying the long weekend in the garden. Whilst you can't really be sure there will not be any overnight frosts at the moment, things need potting on and everything is growing so quickly with the lengthening daylight hours. In my small courtyard garden there is precious little gardening space, so in a sunny part of the garden I use these large growbags, which are double the size of the small ones and just right for growing frut and veg. I bought these frames last year and they fit 3 bamboo canes so that tomato plants can grow upright. I am taking a bit of a risk planting these two tomato plants outside at this time of year but they were getting so pot bound that I decided to give it a go. I can cover them in a fleece if I think they are in danger. I am using a plastic flowerpot with the bottom cut out. This is called a 'ring culture' - it restricts the smaller growth roots at the top of the root system while the longer tap roots which collect water go down into the growbag. It also increases the amount of soil available in a small space. You feed the top, and water the bottom. Left is a Sungold tomato and right is a Chocolate cherry tomato. Last year I grew new potatoes in a plastic growbag. Well, actually I was a bit lazy last year and didn't get around to clearing up the bag and compost after I had harvested most of them. So, you can see that these last few potatoes have sprouted up as volunteers! This is my favourite variety Epicure. I will make sure I top dress with some compost so that there are plenty of nutrients in this compost because it was used last year and potatoes are greedy feeders. I will make sure they are well fed and watered. The little potatoes survived the Winter very well. Just a few days ago I decided to plant a few squash seeds. It is recommended that you plant 2 or 3 seeds in a pot and then choose the strongest plant to pot on. Well you can clearly see the reason for this - on the left side are my Uchiki Kuri squash seeds. One of the 3 is growing strongly, one is a little mis-shapen and still quite strong, and the 3rd is tiny and unhealthy. Do not be tempted to mollycoddle this little seeding! However much you try to nurse it back to life it will never do well and it will be a waste of time and space. Chuck it out! The pot on the right side are amazingly strong and healthy! Romanesco courgettes from Seeds of Italy. All germinated in just 2 days, coming along really strongly. Time for potting on this weekend methinks! Last year I bought an espalier Williams pear tree. It grows in my small London courtyard garden in a pot, but really needs a pollination partner to properly set fruit. So a couple of weeks ago I took it for a little pollination holiday to my Sister's allotment where she has a Conference pear tree. They were in flower at the same time so it looks like a good match. You can cross pollinate with another variety in the same, or adjoining, pollination groups. Basically, as long as the trees are in flower at the same time, it can cross pollinate. So my Williams pear is a B group pollinator, and is in flower at the same time with this Conference which is an A group. Confused? This handy guide explains it better. So it looks as if I have a fairly good fruit set now, so my little tree was carefully brought back home yesterday. Williams is partially self-fertile but as long as there is another compatible pear tree within a few gardens, the bees will do the hard work. Now safely back home and settled down in the garden again. Watch out for night time frosts! We might be having warm days at the moment, and my tomato plants are really doing well - but I think I will bring them inside tonight just to be sure. This time of year in the vegetable garden is known as the 'hungry gap' just when most of your Winter veggies are finishing and the Spring harvest is just getting going there is little fresh greenery to choose from. Now is a good time to look to the hedgerows! It is fairly well known that you can pick and eat stinging nettles, but what else is there? Did you know you can pick and eat hop shoots? One nice portion fits into a small handful like this. On holiday in Venice a couple of years ago I saw this local delicacy for sale in the Rialto Market. In Italy it is known as Bruscandoli, they chop it up and eat it as a vegetable, or traditionally in a Bruscandoli Risotto. Sold in bunches on the market for onl a few short weeks at this time of year. So I gently simmered it in water for about 5 minutes and served with butter. This really was lovely! A tasty green vegetable dish which tastes somewhere between spinach and asparagus. Highly recommended! Matron doesn't do flowers! But, with the exception of edible flowers - here I make that exception. Whilst out walking I found a carpet of sweet violets in the woods, this common flower is found everywhere at this time of year but only for a few weeks. The flowers have a wonderful violet perfume hence the Latin name Viola Odorata. It was also an old Victorian tradition to preserve the flowers in sugar and make cake decorations, so I decided to have a go. Just brush the fresh flowers with egg white and sprinkle with caster sugar. You have to have delicate fingers to make these preserved violets, so gently I put them on greaseproof paper and dried them on my heated propagator for a couple of days. You can also do this with primrose flowers. I suppose at this point I should give a warning that if you are not 100% sure what it is then don't pick it or eat it!... so, with the Easter weekend coming up I decided to give it a go. So I made a lemon drizzle cake and decorated it with preserved flowers! Happy Easter everyone! The walled kitchen garden at Grims Dyke has some wonderful South facing greenhouses, but you can see in the background here, that large Leylandii completely shading one of them. It is in dire need of restoration, you can see a couple of old vines growing inside this greenhouse which is currently being used as a storage area. Take a look at this lovely wrought ironwork supports for the greenhouse. Wouldn't it look lovely if it was restored? I kept thinking that this must have been what the Lost Gardens of Heligan looked like when they had been neglected for so long. To think that in years past this greenhouse would have been growing melons, grapes, peaches and even pineapples! One ray of hope was this small row of purple sprouting broccoli. To think that Grim's Dyke is actually a country house hotel and restaurant - and they don't grow their own fresh food is a tragedy! The restaurant kitchen is only 50 yards away! I spotted a small pot of lovage discarded on the ground too. There were also a few gooseberry bushes too, but just full of tulips. I can only live in hope! Well, Daisy had a good day out!... for someone who 'doesn't do flowers' perhaps Matron might have named her sprout... or zucchini.... or aubergine.... or parsley.... never mind! Don't worry dear reader! Matron does not do flowers. I went on a pilgrimage of sorts yesterday to the home of W.S.Gilbert - (of Gilbert & Sullivan fame) Grims Dyke in North London. This beautiful Victorian building was the home of Sir William and Lady Gilbert from 1890 until his untimely death in the boating lake here in 1911. The house was used during World War 2 for military intelligence projects which were associated with Bletchley Park. Whilst Sir William Gilbert modernised and rebuilt much of the house (and wrote just a few light Operas with his friend Sir Arthur Sullivan) Lady Gilbert set her mind on renovating the 40 acres of grounds and gardens which had been overlooked and overgrown for many years. She planted many flowers that bloom in the Spring! I was filled to the brim with Girlish glee to see Lady Gilbert's orchard which still stands today, many of the original trees are here, some rare Victorian species of apple such as Ribston Pippin, and apple varieties local to Middlesex and Hertfordshire. Today the orchard is maintained by volunteers from the London Orchard Project. So with cat like tread I made my way through the old apple trees and the dear little buttercups underfoot. 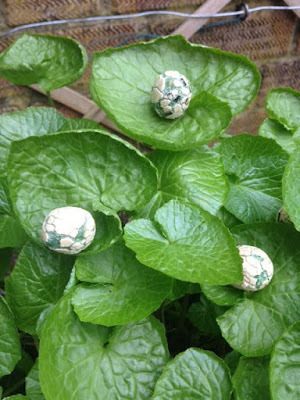 About 4 years ago I bought this Wasabi plant at the garden centre RHS Wisley, A little research showed me that it does best in shady wet areas, so I placed it under a dripping tap against a North Wall and it was doing fine. Wasabi is the prized condiment Japanese Horseradish. These roots make a strong horseradish sauce that you see in little packets when you buy sushi. So I've waited 4 long years for it to show any fruit or flower... but when I peeked into my Winter greenhouse this morning.... all that waiting has come to fruit! Finally I have Wasabi nuts on the plant! I am thrilled to pieces! 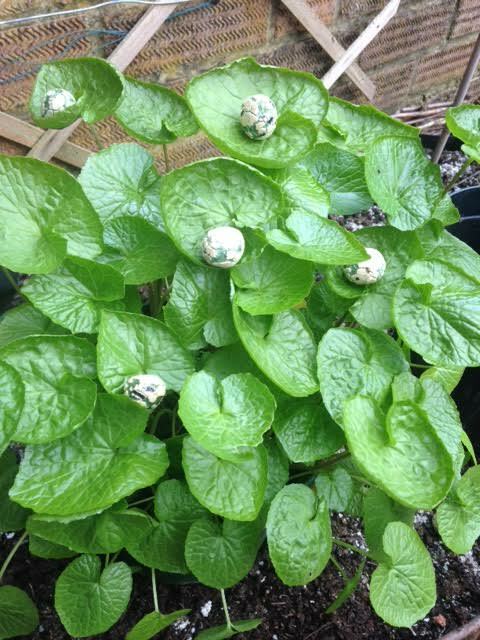 Gorgeous, tasty horseradish flavoured nuts have finally appeared on my Wasabi plant!